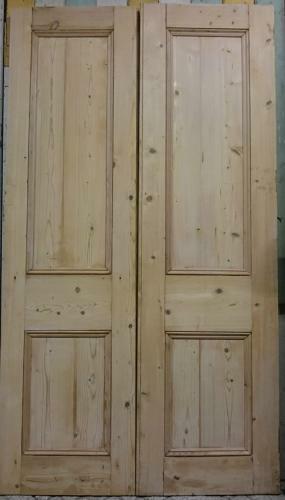 A pair of substantial reclaimed, late Victorian, stripped pine panelled internal doors that would be also be suitable for a cupboard. Each door has 2 fielded panels with decorative moldings on either side. The doors are well constructed with good quality pine and have a rebated inner edge so the doors fit well together. The doors are antique and therefore have some signs of wear. There are visible patch repairs, marks and some water stains. There is some slight damage to the side of one door with a split in the wood and some indentations. One door has a cutout from the original lock on the inside face. This can be patch repaired for an EXTRA CHARGE of £24. Please let us know at time of purchase if you would like this service. There are some large surface cracks that do not affect the structural integrity of the doors. Small holes and some knocks to the edges can be seen. The doors are in solid useable condition but would benefit from refinishing by purchaser as desired, perhaps with a wax or paint finish. The doors are an ideal size for a wardrobe front, en-suit or conservatory and have an attractive design and an abundance of style.